Please join us for our Annual Membership Meeting on September 13th at 6:30. Please be advised your dues must be current in order to vote during our Membership Meeting. Membership status will be available at the meeting, so you may pay your membership dues at that time for the upcoming year. We would like to express our thanks to Bill Pilkington for the new web site. 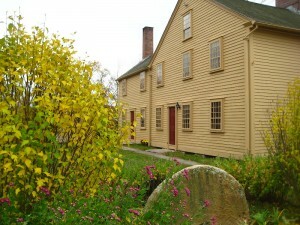 I have already received numerous compliments regarding the site; take a look if you haven’t seen the web site recently www.smithapplebyhouse.org. Follow the Smith-Appleby House Museum on social media — on Facebook at facebook.com/SmithApplebyHouse, and on Twitter at twitter.com/SmithAppleby. Many thanks to Greg Williams for his help this year, and please join us in wishing him good luck as he learns the masonry trade in Maine. Neighbor Bob Guertin has been manning the garden tractor this summer keeping all the lawns mowed, so many thanks to Bob as well. We will be discussing upcoming events at the membership meeting, with a request for volunteers. If you are unable to attend, but would like to help with an event, call (401 231-7363) and leave a message at the museum. No experience necessary! One event specifically can use some help; on September 15th from 1-4 we are having an open house, and will be making cornhusk dolls in the barn. I can use more husks, and corn tassels, just in case you are eating fresh corn these days! I snip the tassel (just the dark brown part, for doll hair), and remove the very dark green outer husks (usually only one layer). I use the soft light green husks as they are perfect for the dolls, and dry beautifully when left in the sun. The day of the event the dry husks are soaked in hot water in order to be pliable to make the dolls, using a Penobscot Indian design. Again, please join us on September 13th (Thursday evening) at 6:30 at the museum for our Annual Membership Meeting. Light refreshments will be served.